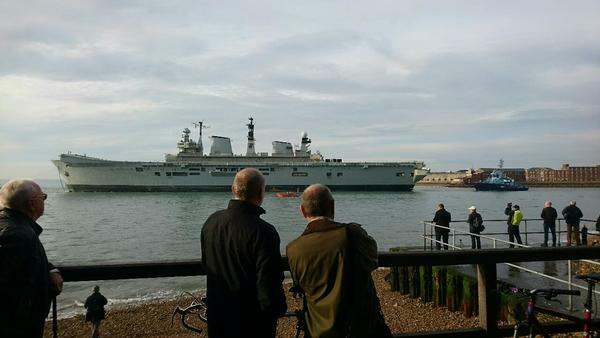 Former captains and crew members of Royal Navy aircraft carrier HMS Illustrious have said their final farewells in Portsmouth - along with a crowd of hundreds. The decommissioned warship, which first served in the Falklands in 1982, has been towed out of the city - on her way to a Turkish scrapyard. 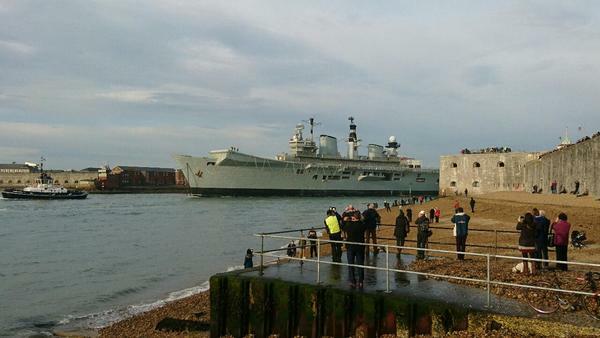 The 22,000 tonne ship, with its paint peeling and engines ripped out, was pulled by a tug out into the Solent. Former sailors gave a salute and three cheers as it sailed past the Round Tower in Old Portsmouth, the traditional vantage point for families to see warships arriving and leaving the historic base. Illustrious was formally decommissioned in August 2014 after 32 years of service and has been sold to the Turkish company LEYAL Ship Recycling Ltd for about £2 million. The sale came despite proposals to turn the carrier into a floating hotel, museum or even a UK centre for powerboats. Following the retirement of the Harrier aircraft in 2010, Illustrious went on to serve as one of the Navy's two helicopter carriers. This has left the service without a fixed-wing aircraft carrier until the first of the next generation of carriers, HMS Queen Elizabeth, is due to be commissioned next year. ``Over three decades Illustrious set the highest standards for service that the Royal Navy will continue with HMS Queen Elizabeth when she arrives into Portsmouth next year. ``Lusty provided a world-class service to the Royal Navy and we bid her goodbye with fond memories. Illustrious is the last of the Invincible class of aircraft carriers which included the Ark Royal and Invincible which were introduced into the Navy in the 1980s. The carrier, which was built by Swan Hunter shipbuilders on the Tyne and launched by Princess Margaret in December 1978, had its entry into service brought forward so it could assist in the Falklands War effort. The warship's deployment was so rushed that its commissioning ceremony took place at sea en route to the Falklands on June 20, 1982, while it was formally commissioned on its return. During the conflict, it relieved sister ship HMS Invincible in providing a floating airfield for aircraft unable to use the islands' damaged RAF base. Illustrious then went on to support the forces in Afghanistan and served in the Bosnian and Sierra Leone conflicts and also helped evacuate Britons during the Lebanon war in 2006. In 2013, Illustrious was involved in the efforts to distribute disaster relief in the wake of Typhoon Haiyan in the Philippines.